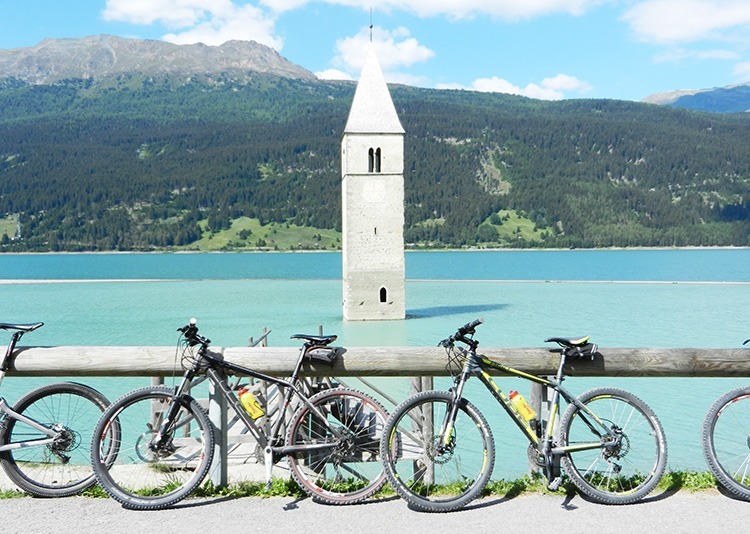 An easy paced cycling holiday in Austria also visiting Italy, is ideal for those wishing to experience the beauty of the Alps in style. The riding is concentrated along Via Claudia Augusta, a 2000 year old Roman built road which was, for many centuries, the main commercial route across the Alps. Originally used for the transportation of wine, olive oil from Spain, and oysters from the Mediterranean and even spices from Asia, it now serves as the perfect biking route through an area of stunning views and historic sites. The journey begins in Austria on the slopes of the mighty Zugspitze (2692m) and takes in some of the most beautiful Tyrolean landscapes imaginable. From Lermoos our journey heads off on a series of rolling forest trails and across undulating countryside trails, before heading upstream alongside the icy waters of the River Inn, the most important in the Tyrol region. Crossing the border into Italy via the Rescen Pass, the panoramic views open up as we roll gently down into the Vinschgau Valley and the South Tyrol. The ride continues via apple plantations, vineyards and historic castles and of course taking time during our meals to sample the food and wines for which the region is famous. As the week draws to a conclusion we enter the Etsch valley which leads us straight into the bustling city of Trento, where we can spend an afternoon soaking up the trendy Italian atmosphere in the numerous gelaterias and capuccino bars. Of course, we don’t want to overdo it in Trento, as we need to reserve a little energy for the last day of riding through the Sarca Valley and onward to our final destination Lake Garda, a grand finale to our Via Claudia adventure. The post Customer Story: La Via Claudia in motion appeared first on Skedaddle Blog.